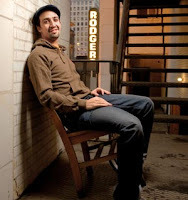 The announcement today that Whoppi Goldberg will host the Tony Awards this year reminded me that I never put up a link to my story about likely nominee Lin-Manuel Miranda, creator and star of the Broadway show In the Heights. Lin-Manuel, who is only 28, started writing his show when he was a sophomore at Wesleyan and never expected to act in it. But his collaborators found that no one knew the show’s freestyle raps as well as he did, and thus, somewhere along the way to Broadway, Lin-Manuel became the star. For some reason, I found that really funny. When we spoke, Lin-Manuel was quick-witted, fast-talking, and very engaging; it was a really enjoyable interview. And for more insights about Lin-Manuel, check out his YouTube channel, where you can watch, among other things, Lin-Manuel lip-synching and dancing to “King of Wishful Thinking” from the Pretty Woman soundtrack. Actually, the video is so priceless that I’ve embedded it below. Anyway, here’s a link to my article so you can read it if you’d like. We’ll find out Tuesday morning if Lin-Manuel is among those who’ve been nominated for a Tony. I’d wish him all the luck in the world, but I really don’t think he needs it. Chances are good this guy will collect not just one but a couple statues when they’re awarded next month.